The opening sequence sets up the aesthetic language of his film. It’s a Hitchcock-like sequence crafted without dialogue using sound and editing in tandem with his compositions to craft a classic suspensful set piece. Fontaine (François Leterrier) is a French resistence agent sitting in the back seat of a police car on his way to prison. Without speaking we know he’s up to something. He carefully eyes the door handle, close-up edits to the driver’s changing gears and accelerating create teeth-grinding tension. We sense Francois waiting for that right moment to escape. When he does Bresson does not show the confrontation, instead staying on the other captives in the back seat staring off without emotion, inpliciting knowing his attempt was ill-conceived. 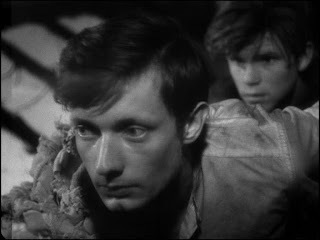 Here’s we get to see Bresson’s remarkable use to close-ups and editing to tell his story. As Fontaine tours his new prison he immediately knows he’s going to try to escape, he takes no time enlisting resources to help him, men from the food line, access to the outside via three elder men in the courtyard. The tools of his escape are meticulously described – a safety pin to release his cuffs, a spoon to carve out the wood from his door and the makeshift rope fashioned from old blankets and metal rods. Bresson’s repetitive use of these close-ups we can see evidenced Stanley Kubrick’s equally remarkable crime procedural The Killing. By the degree to which Fontaine’s rope is photographed in close-up repeatedly, this inanimate object becomes a character as important as his supporters and colleagues. 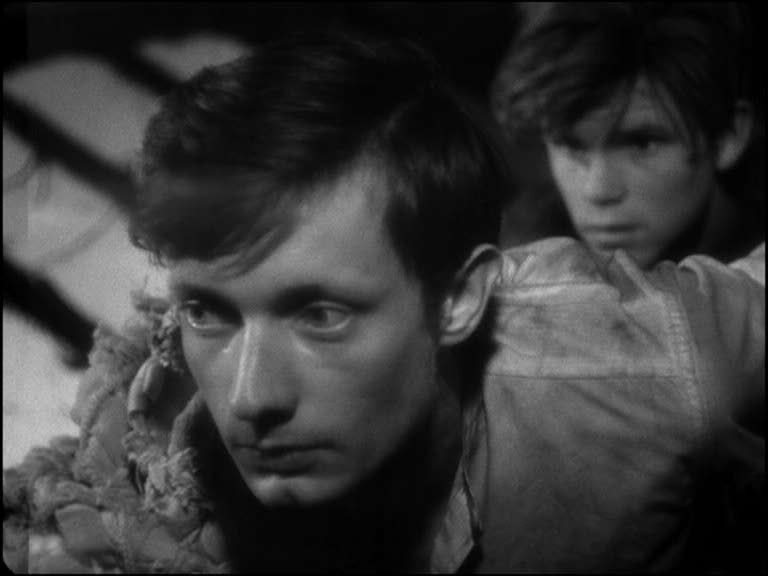 By methodically parsing out of the details of the heist Bresson is able to manipulate the emotions of the audience. And by contrast, by stripping away the emotions of his characters in the film, Bresson’s arrives at the essence of action/suspense cinema, development of character through action. Though slight in dialogue, Fontaine emerges as a uniquely fascinating character study. As a resistor of the Nazis there’s little conflict in his action. Clearly his escape is driven by patriotic zeal and a desire to win the war. But when, in the third act, he’s suddenly partnered with a new German prisoner in his cell, he has to make a decision to bring François, a young 16 year old along with him, or kill him before he embarks on his journey. His ultimately decision to bring him resonates as a deeply profound decision – a palpable father-son bond which emerges in the end, during the escape. The carthsis of the final moments of the pair is played as a matter-of-fact, without the histrionics we’d expect in a Hollywood film. And as exemplified throughout the film, by dialing back, in extremis, on the emotional dial, has the effect of heightening the emotional punch to the audience.